Gary Russell of Columbus, Ohio, is a newcomer to the NHC Tour but plays with the smarts of a contest veteran. The wise-beyond-his-years savvy can be traced, in part, to the help of a willing mentor in NHC regular Mike Elsass, also from Ohio. 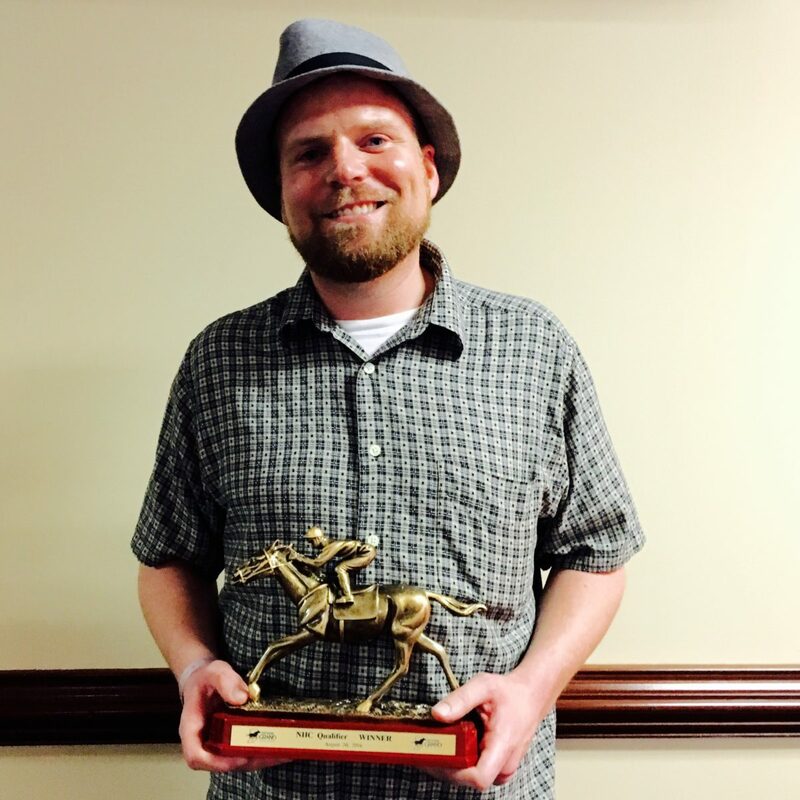 The 35-year-old senior financial analyst for a major retail company, who just joined the NHC Tour earlier this month, teamed with the 69-year-old abstract painter, a six-time NHC finalist, to win Saturday’s inaugural NHC Qualifier at Indiana Grand Racing & Casino. It was Russell’s first attempt in an on-track NHC qualifier and already he’s punched a ticket to Sin City for the world’s richest and most prestigious handicapping tournament, the $2.8 million (estimated) Daily Racing Form/NTRA National Handicapping Championship presented by Racetrack Television Network and Treasure Island Las Vegas, Jan. 27-29, 2017, at Treasure Island. What made you want to play in the Indiana Grand contest? How did you manage to win? Can you describe the day? “So many things that could have gone wrong for us went right instead. For instance, one of my early picks was a 20-1 shot at Del Mar, Souper Knight, and that one hit and put us in the lead. Right after that we had a 6-1 shot at Saratoga so we were feeling pretty good. Then we went cold for a while but the other ticket started picking up. We had a 12-1 at Del Mar, a 19-1 to place at Saratoga and a couple winners at Indiana Grand. You hit pretty much every decent price at Del Mar that afternoon. How’d you come up with Zapperkat? How did you react when you realized you were going to win the contest? “I’m not one to yell and scream at the track – that doesn’t do you any good – but I definitely felt good on the inside. I think after being so quiet all day when I told my waitress I thought I’d won she didn’t even believe me. What was it like playing in your first NHC qualifier at a racetrack? What tools do you use to handicap? How did you first get interested in horseracing? “My first job out of college I was living in Lebanon, Ohio, and it became a Thursday night tradition for me and a couple of buddies to go up to Lebanon Raceway. It was just simulcast but another time we got the bright idea to drive the 45 minutes to River Downs. I started going there a few times a year but as I got older I realized that most of the things people do on weekends in their early 20s weren’t near as much fun as they used to be. I had to find something else to do with my time and I drove past Scioto Downs and was like, that’s it. Then it became a twice-a-month hobby, then once per week. What do you think NHC 18 in Las Vegas will be like? Will you do anything to prepare between now and January?